David Bivin is the founder and editor of Jerusalem Perspective, a journal that explores the Jewish context of the Gospels. He has traveled and lectured internationally for more than 25 years, and is the author of hundreds of articles on that subject. 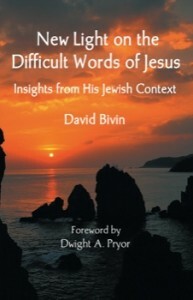 New Light on the Difficult Words of Jesus is a collection of some of his best writing on the Jewishness of Jesus, edited for the general reader. The book examines Jesus’ lifestyle as a first-century Jewish rabbi, and looks at how his words would have been understood within the larger framework of first-century Judaism. Many scholarly footnotes make it a valuable help to those who want to study in depth. Now available! Order New Light on the Difficult Words of Jesus ($13.99). How is this book different from Understanding the Difficult Words of Jesus (1995, Third Printing)? Despite the name similarities, the two books are unrelated. The older book talks about language issues in the gospels. “New Light” presents an overview of Jesus’ teaching ministry and Jewish life in light of his context. As an editor, I took part in the discussion for what to title “New Light” when it was published. We liked the phrase “difficult words of Jesus” — it seemed appropriate and made people curious. But now I see that the similar name sounds as if the books are related, which isn’t actually true. Check out the sample chapter pdf for more idea of what New Light is like. Thank you, Lois. That really helped! Is this book available as an e-book? If so, where can I buy it? You can get an ebook version at Amazon at this link.